Welcome to the Custom Sign Co. Where you provide us with a photograph and we will turn that photograph into a custom made lighted sign for you or your business. All custom-made LED lighted metal signs are manufactured on a one quarter inch powder coated steel frame, painted with high gloss white paint. Superior quality LED mini lights are then installed on the frame using white plastic clips. This makes each bulb always point in the same direction. All our LED lighted signs are high quality and made in the USA. 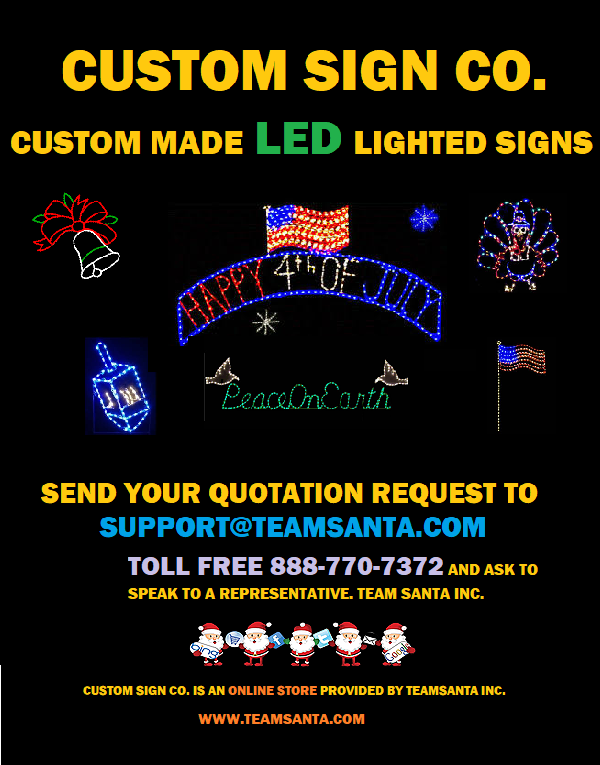 If you would like to place an order for a lighted sign or to inquire whether we can make the custom lighted sign that you want, simply send your photograph to support@teamsanta.com and include all the pertinent information about the sign with your request. Please do not forget to provide size information. We will get back to you with a written quotation sent to you by email. Coupon discounts are not eligible to be used on custom made products. Once you approve, payment is made securely online with credit/debit card. You can also use a PayPal account if you have one. You approve the design and we will build your sign. That’s our motto. Signs are shipped via FEDEX 3-5-day service. Custom Sign Co. makes LED lighted signs for businesses, hospitals, reception centers, restaurants, pubs, legion halls, catering facilities, bars, homes, etc. The list can really go on and on. We have made some interesting signs over the years. October 15th is the deadline to place an order. If you have any questions, comments, etc. please send us an email and tell us about it. support@teamsanta.com or call toll free 888-770-7372 and request to speak to a representative.